In the August Inspired Writer eNewsletter, we announced that interactive whiteboard writing and grammar lessons would soon be available to our current WriteSteps’ teachers. We are happy to announce that 2nd and 5th grade teachers have the opportunity to try the first set of lessons before they are open to the public! Rita Heeter, Heidi Neely, Stephanie Miller, Julie Schwab, and Tina Dawson, creators of the 2nd and 5th grade eWriteSteps Engagers lessons. Cranberry Elementary teachers (Julie Schwab, Heidi Neely, Rita Heeter, Stephanie Miller, and Tina Dawson) in Seneca, Pennsylvania saw the benefit of teaching writing with interactive whiteboard lessons, and approached the WriteSteps team with their idea to turn WriteSteps lessons into engaging interactive whiteboard lessons. 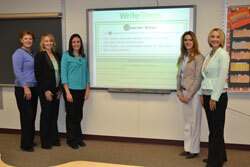 From the seed of an idea to comprehensive interactive whiteboard lessons, eWriteSteps Engagers™ are here for your use. 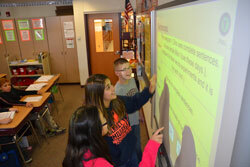 5th Grade Students enjoying the interactive features of eWriteSteps Engagers. For a limited time, eWriteSteps Engagers are available to 2nd and 5th grade teachers with an active eWriteSteps subscription at the special introductory rate of $40 per teacher. The second semester lessons (Units 3a-6) will be available for use through June 30, 2015. 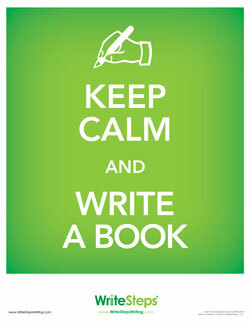 We have submitted WriteSteps to Learning List for an independent review. Learning List is the industry-leading instructional material review service for our nation’s schools and districts. We would greatly appreciate you taking 3 minutes to complete this survey. The feedback you provide will be incorporated into the editorial review of our product and displayed on LearningList.com. An example from a reading product is shown below. Thank you in advance for taking the time to provide information about WriteSteps to Learning List. We greatly value your thoughts and feedback! We are pleased to offer you the opportunity to attend the Florida Educational Technology Conference at a $60 discount- the most comprehensive ed-tech learning event in the U.S.
FETC, taking place January 20 – 23, 2015, at the Orange County Convention Center in Orlando, FL, is the content-rich conference that brings education leaders and technology experts together in Orlando to exchange techniques and strategies for administrative, teaching and learning success. With your discounted conference pass, you’ll have access to 600+ sessions, Keynotes, special events including STEM Excellence Awards, FETC Makers’ Hub and 400 vendors in the comprehensive ed-tech exhibit hall and marketplace – as well as FREE Learning Lab Sessions. If you are interested in attending FETC at the discounted rate, please contact our Conference Coordinator, Sonja Revolinski, at [email protected] to receive the promo code. Stop by the WriteSteps booth at the Florida Educational Technology Conference in Orlando, FL. Suzanne Klein (Founder & CEO) and Kim Gates (National Presenter) will be at the conference. Stop by and say hello! 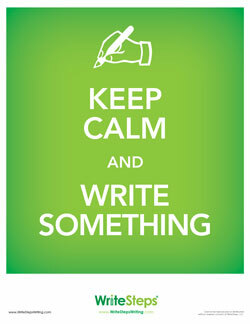 Want to learn more about WriteSteps? Marilyn Massey will be exhibiting at our booth at the Georgia Charter Schools Convention in Lawrenceville, GA. She’d love to talk to you about how we can help improve writing at your school!